We returned home from the Glasgow Crafts for Christmas show and unloaded by midnight last night. It was a reasonable first show in Glasgow for us. I expect we will do it again next year, all being well. 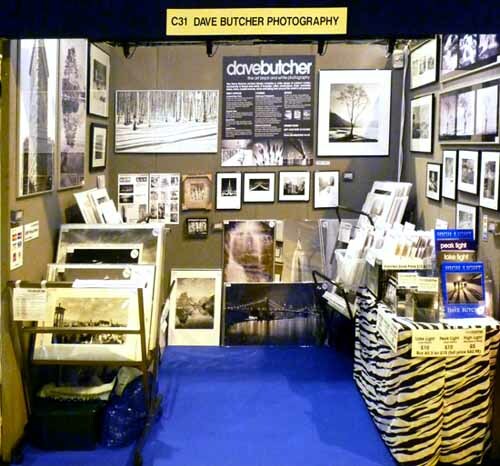 Here is a picture of the stand to give you an idea of what our 4-day gallery looked like. We have another similar show coming up. The stand will be the same size but will look a bit different at the English version of the show, which we set up this Wednesday. It’s still called Crafts for Christmas but is held at the Birmingham NEC from Thursday to Sunday. It’s bigger and was more expensive for the stand but there should be more visitors to help us compensate. Just arranged to meet up with good friends Peter and Sally on Saturday and it coincides with a fireworks display at Kenilworth castle. Jolly exciting!